Wardrobe bursting with clothes? Can't bear to part with some of them? I've faced this problem recently. Having moved back to my parents house, I realised that I have way too many clothes and just not enough space for them all. I've managed to reduce my wardrobe size (reluctantly) so I thought I'd share some tips for those of you who are wishing to cut down your fashion stash. 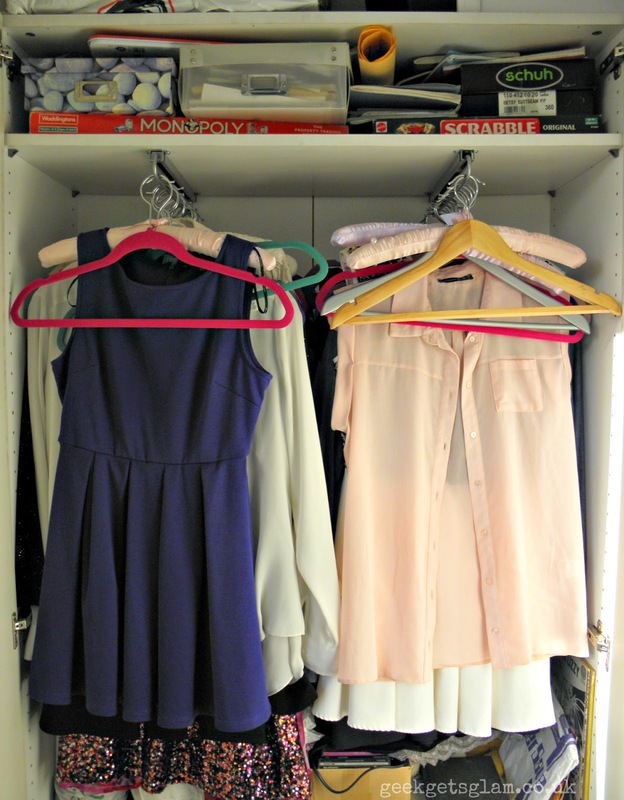 Tidy your wardrobe and put all the hangers facing the same way, say all facing right. When you take one of the rail to wear the clothes, change the direction of it. After a few months, you will see that some of the hangers remain facing right as you haven't worn them at all! This is a good sign that you need to clear some stuff out - what's the point in keeping clothes you never wear? Would you buy it in a shop today? Look through your wardrobe. What things would you genuinely buy if your saw it hanging on the rail in Topshop right now? This helped me so much - I was hoarding so many clothes that I wouldn't dream of buying now as my style has changed so much! This can take some time depending how many clothes you actually own. every single item of clothing can be sorted into the following piles: Keep, Sell, Charity. As you're making a pile of clothes you love and wear, it doesn't feel like you're chucking your entire wardrobe away meaning you can be a little more ruthless! The keep pile is exclusively for clothes you love, can't live without and wear daily. The Sell pile is for clothes that have barely been worn but still in fashion; ones that someone else would buy in a shop today. Any clothes that you hate, are outdated or slightly damaged (not soiled) you can donate to charity. Charity shops soft through clothes and sort ones to sell in shops and ones to sell for rags so some can be a little worn out yet still beneficial! There are loads of sites you can now sell or swap your old clothes. My favourites are eBay (gotta love a classic! ), Vinted and Depop. It's a great way to sell old clothes or, if you can't bear to reduce your wardrobe, at least you can swap for something you will wear more! I hope these tips are helpful on your quest to de-clutter that wardrobe! Good luck!